Manaslu, where you can trek within beautiful views of high snow, capped peaks in the shade of unique culture of high Manaslu areas which is similar to Tibetan traditional way of life as it was for many centuries. This wonderful walk includes beautiful serene alpine woodlands filled with rhododendron-hemlocks-pines-firs-magnolia-juniper and oaks tree lines, where tree lines fade for short alpine bushes as the trek leads towards dry and arid landscapes towards Samagaon and Larkya Phedi. 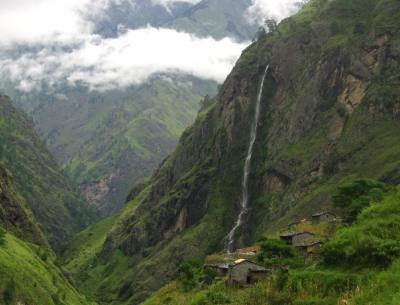 The further walk leads above Larkya-La with incredible scenery of high mountains includes all Manaslu range of peaks with Himlung and Larkya peak close by and then back into lush vegetation and tree lines reaching at famous and popular Annapurna Circuit Trail at Dharapani. finally, our overwhelming walk Around Manaslu Trekking concludes with a drive past Lamjung areas to reach Kathmandu, after a memorable and exciting adventure on Around Manaslu Trekking.